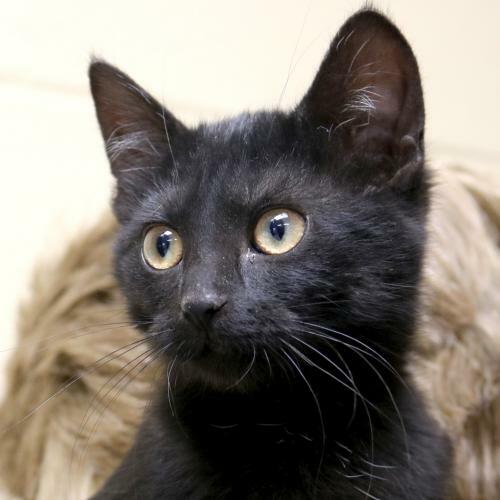 I'm a 5 month old spayed female black Domestic Short Hair. I'm currently staying at PetSmart West in Madison. My adoption fee is $95.00. I have been spayed and vaccinated, and I've received routine treatment for internal and external parasites. I have tested negative for Feline Leukemia. If you are interested in adopting me, the first step is to submit an adoption application. You can download an application from the links below, attach the completed application to an email, and send it to the Humane Society of Jefferson County at shelter@hsjc-wis.com. Once the application is received, the approval process will take approximately 1-3 business days and you will be contacted as soon as it is completed. Please contact the shelter at 920-674-2048 with any questions. Go back to the adoptable animal listings.